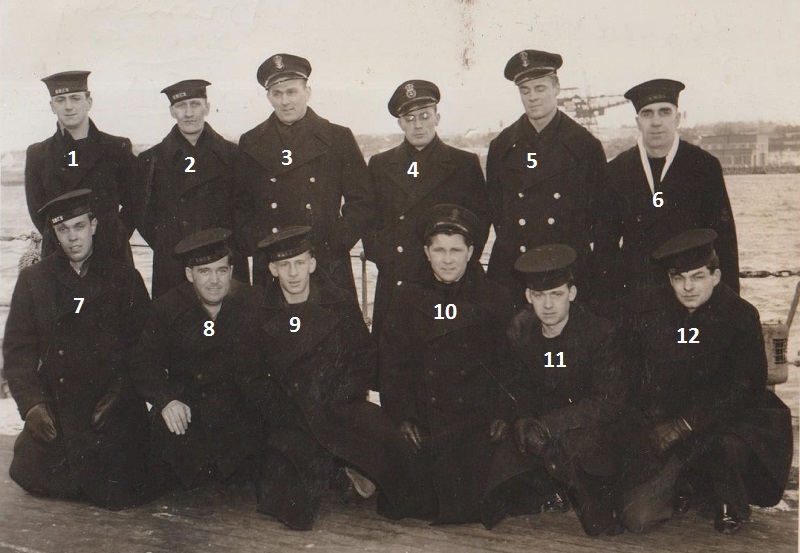 Commissioned on 18 Sep 1942 at Port Arthur, Milltown arrived at Halifax on 27 Oct 1942 and, after working up, joined Halifax Force in Dec 1942. 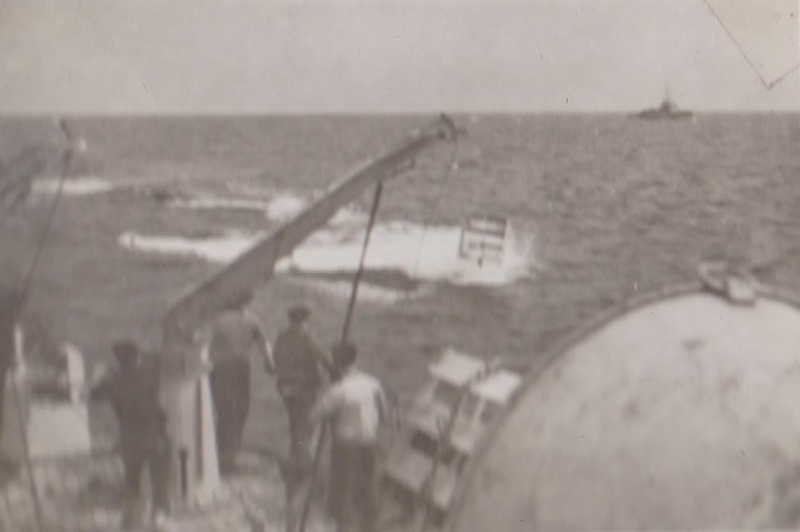 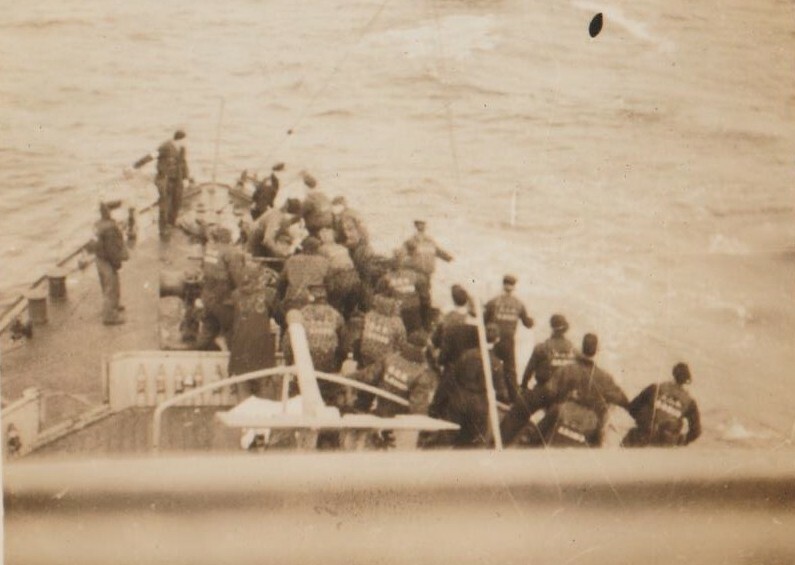 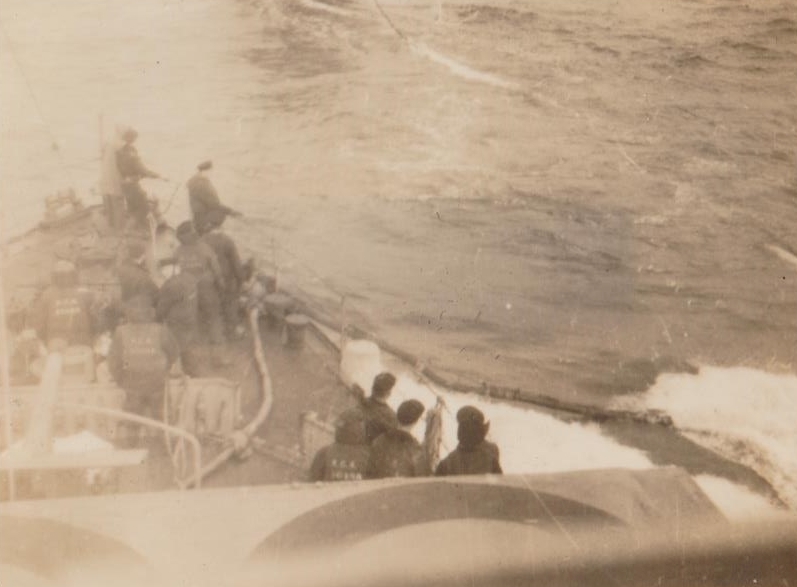 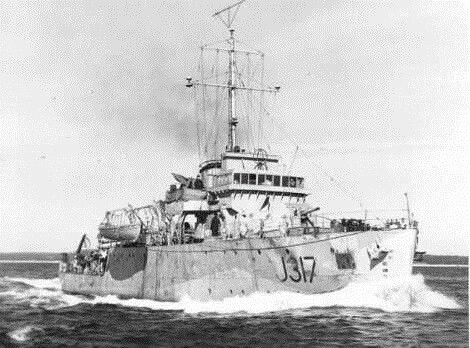 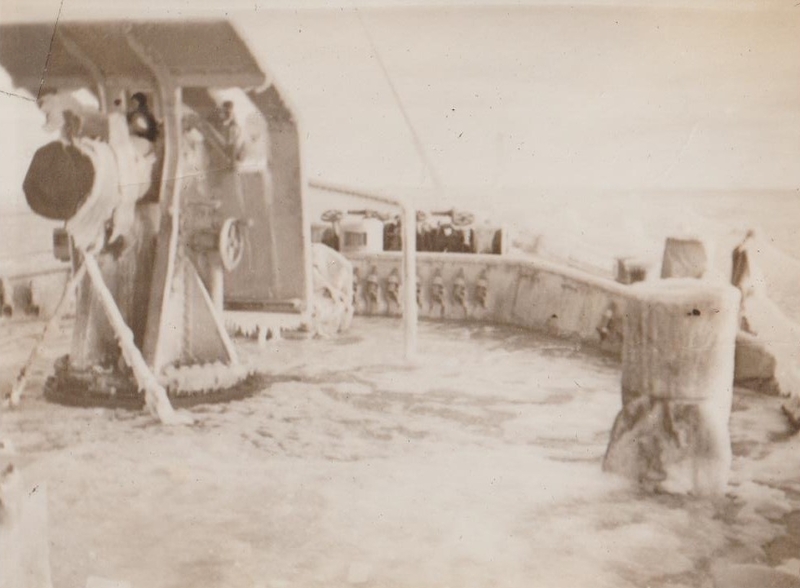 In March 1943, she transferred to WLEF and in Jun 1943, to Gaspé Force. 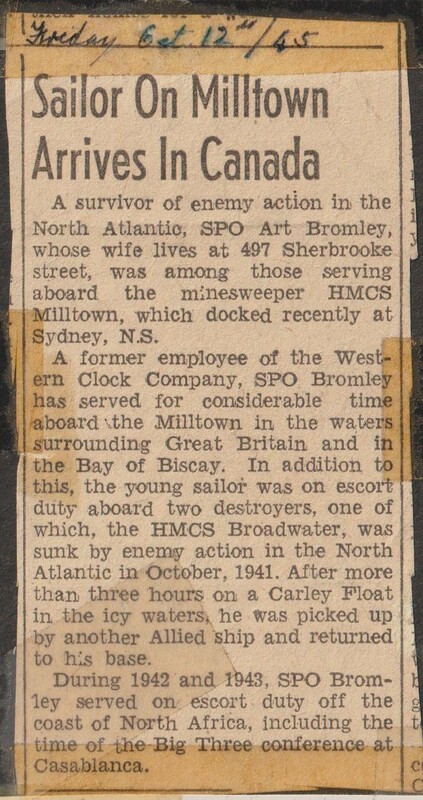 In Nov 1943, she returned to Halifax Force until 20 Feb 1944, when, with Blairmore, Fort William and Minas, she sailed via the Azores for Plymouth, arriving on 08 Mar 1944. 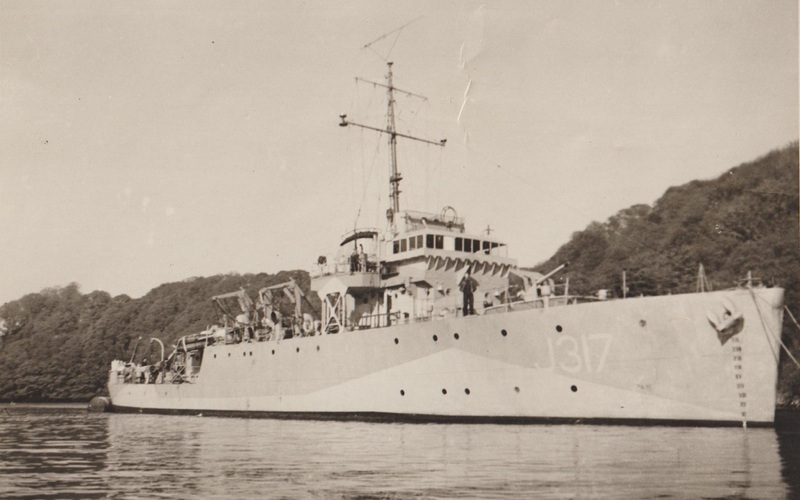 She was present on D-Day with the 31st Minesweeping Flotilla. 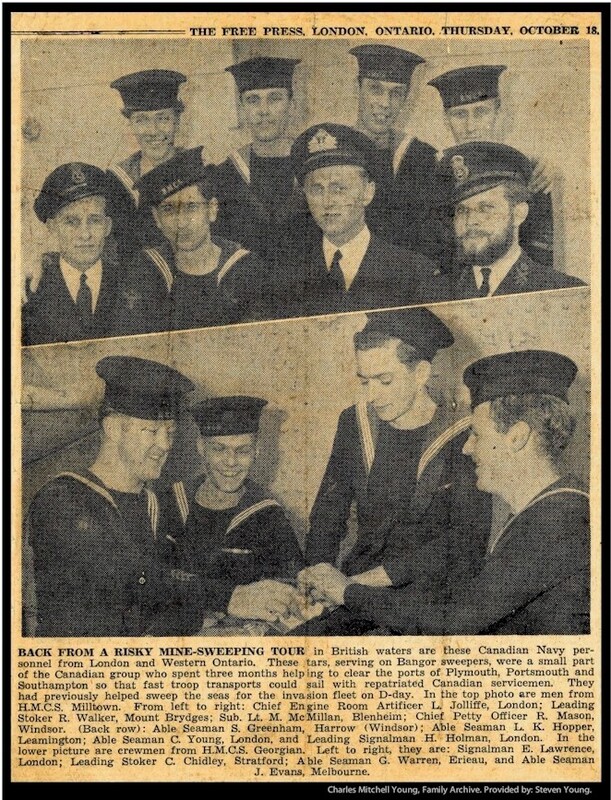 She returned to Canada to refit at Saint John, N.B., from Mar to Jun 1945, leaving Halifax 23 Jun 1945 for Plymouth via the Azores. 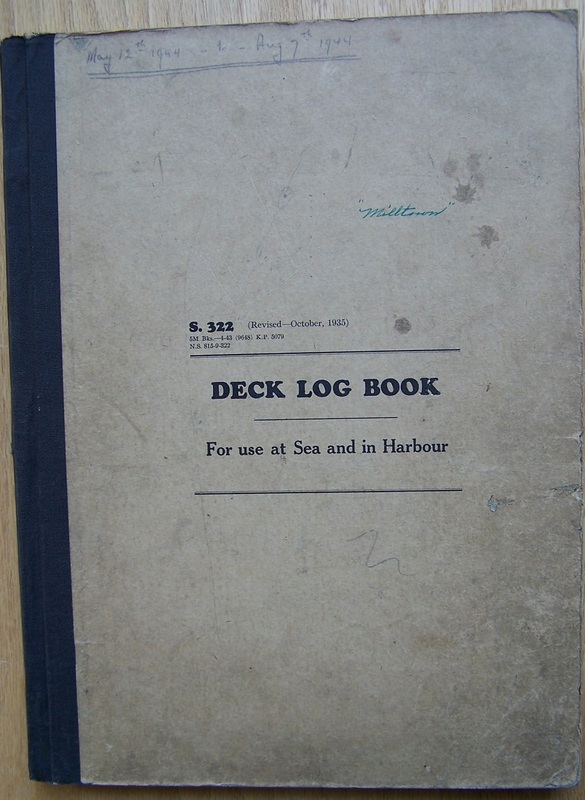  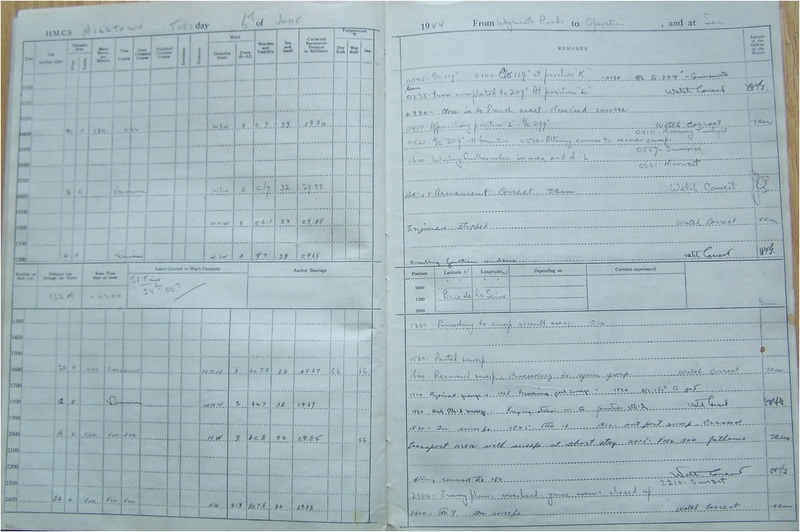 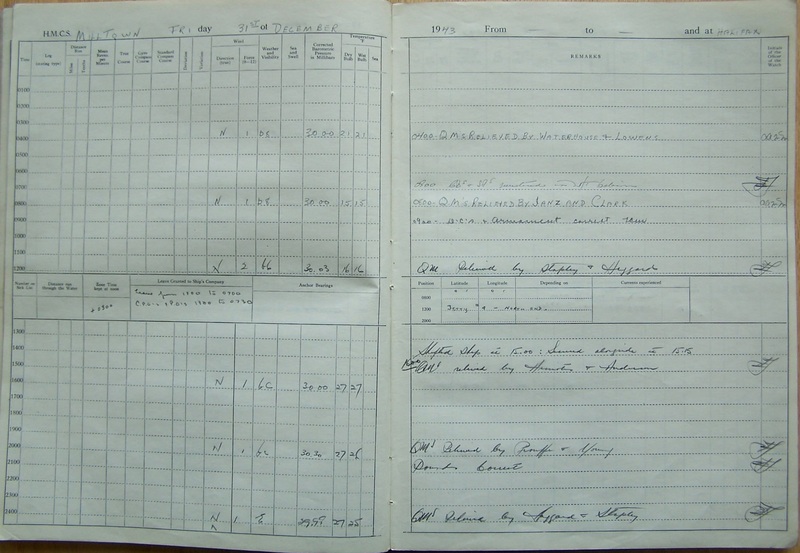 She left Plymouth for home on 21 Sep 1945 and was paid off on 16 Oct 1945 at Sydney and laid up at Shelburne. 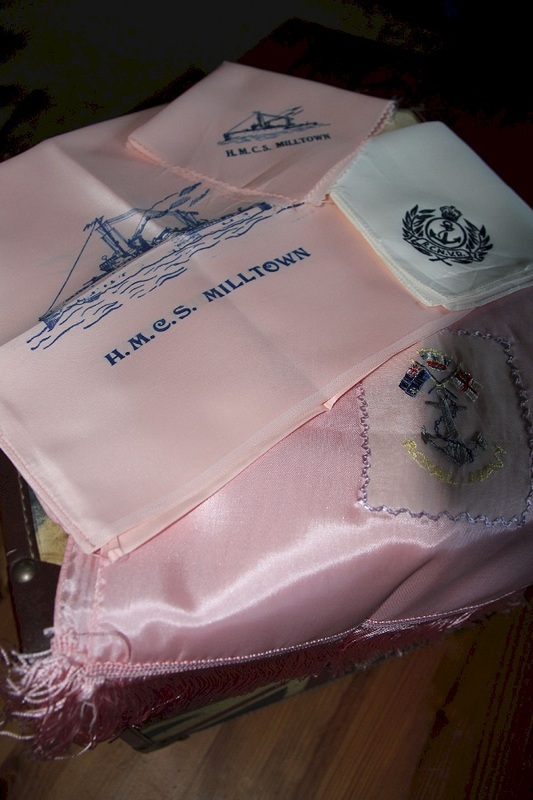 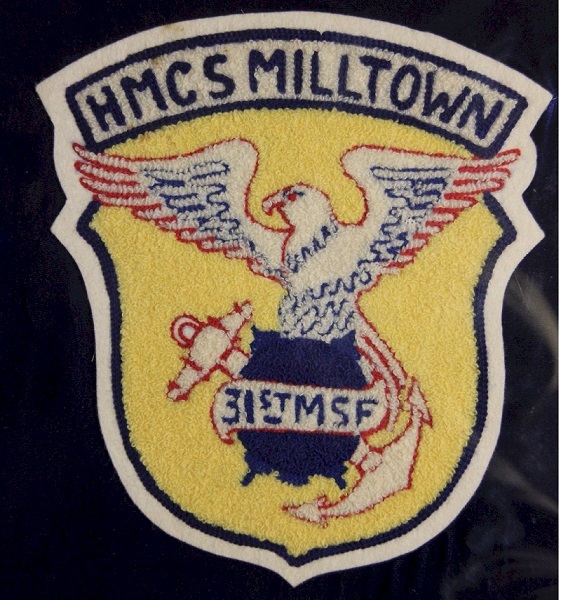 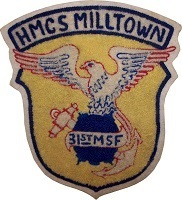 Milltown was placed in strategic reserve at Sorel in 1946, but re-acquired by the RCN in 1952 and kept in reserve at Sydney until Feb 1959, when she was sold for scrap. 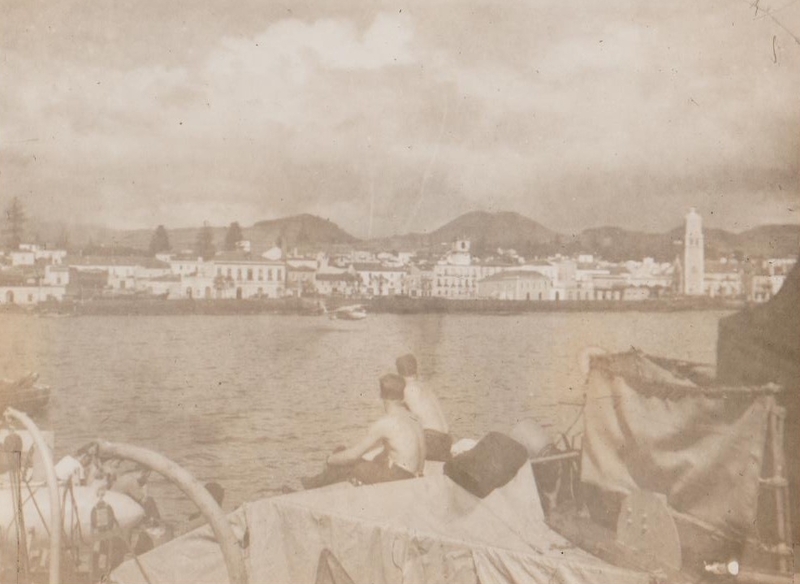 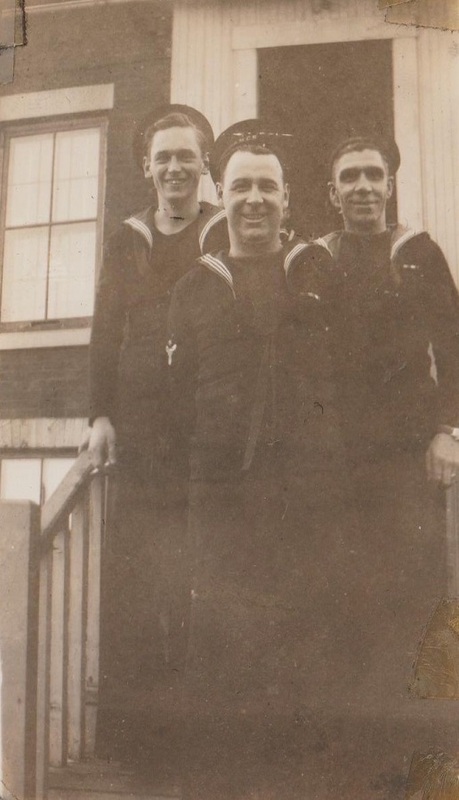 Dorrington (Darrington ?sp), William, (of Inverness) ERA3 - (NR45). 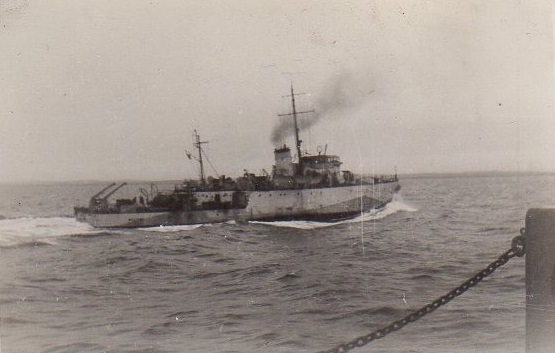 L/ERA during D-Day - 1944-1945. 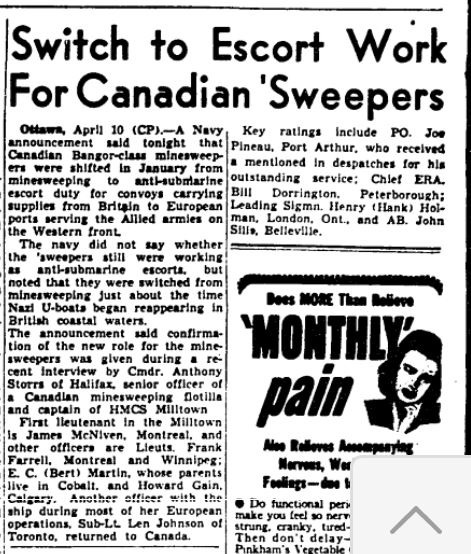 List in article Apr 1945 as CERA. 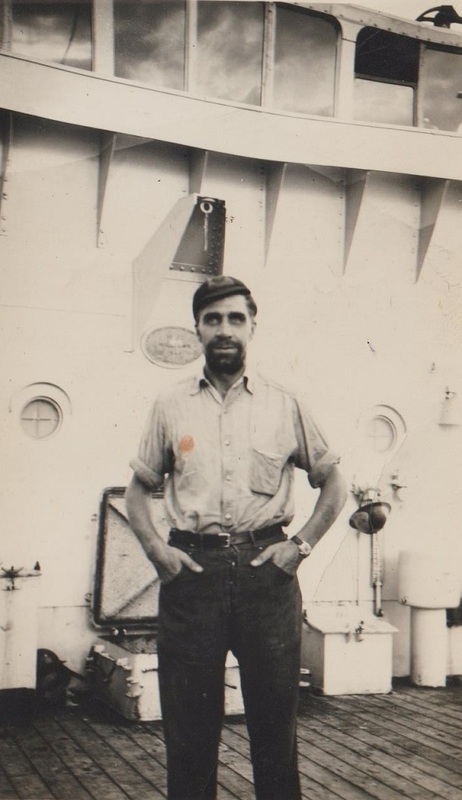 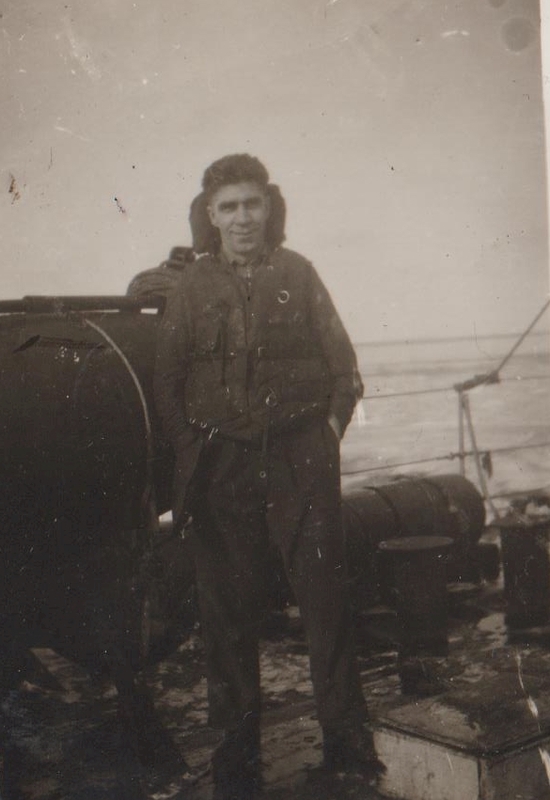 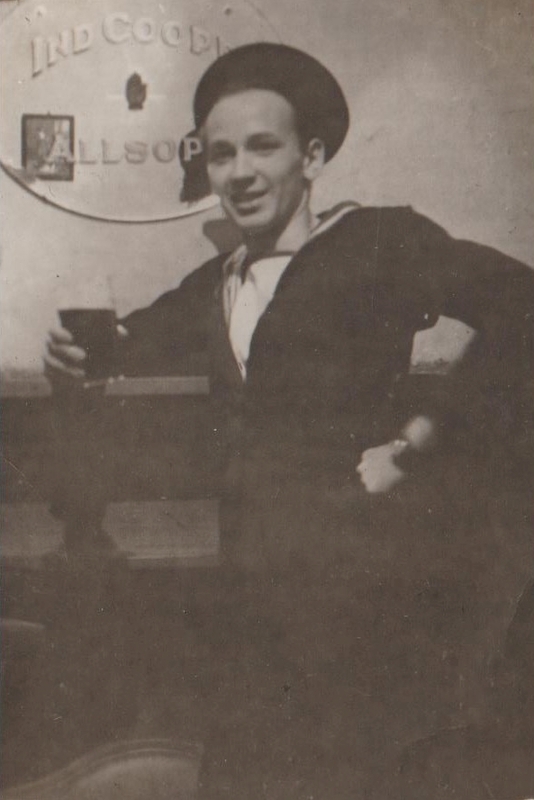 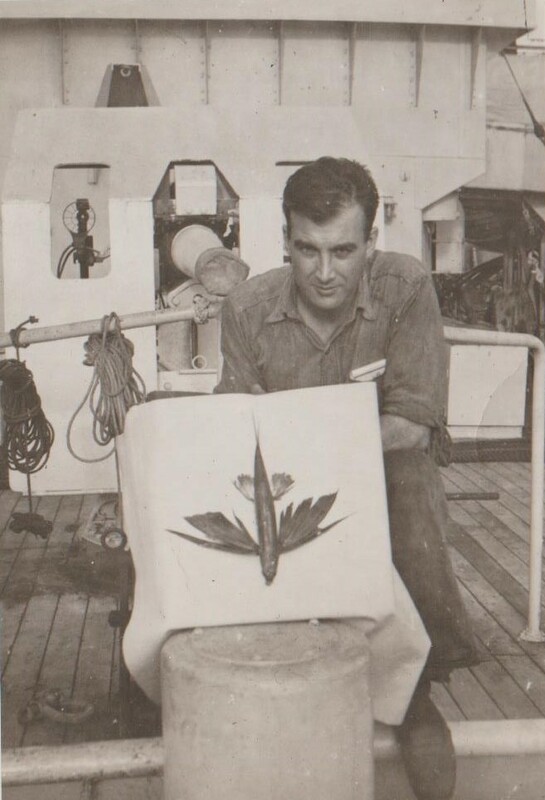 Martin, Ethelbert Cowley (Bert), Slt, RCNVR - 26 Feb 1943 / 26 Mar 43. 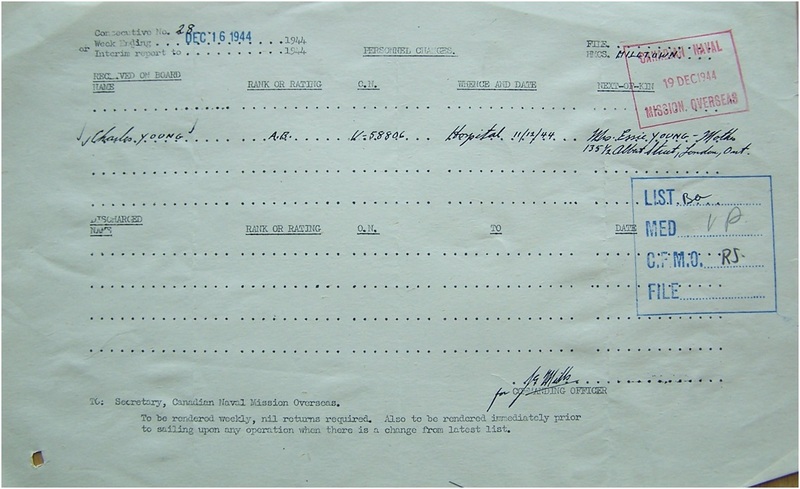 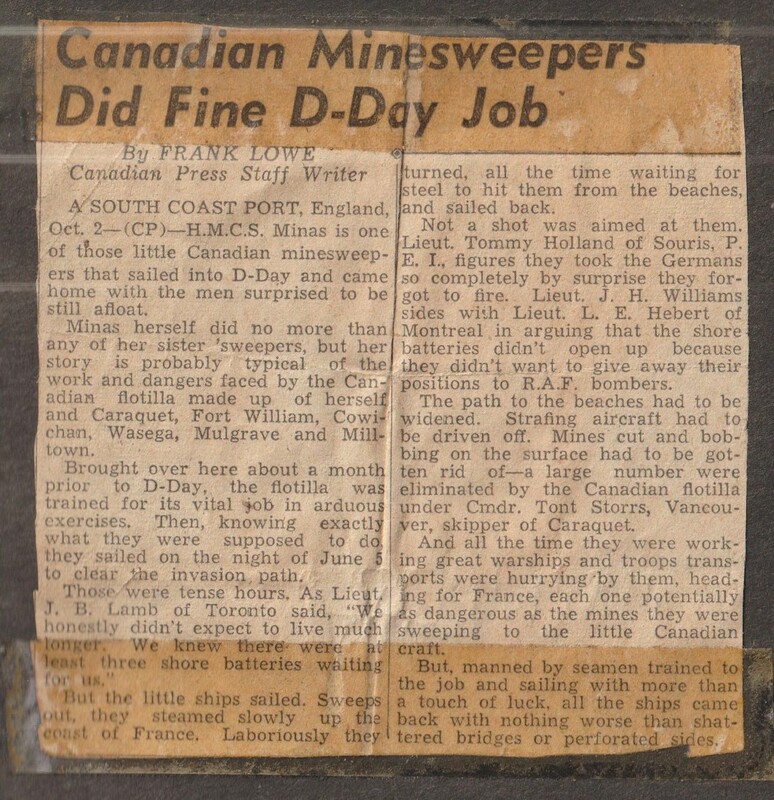 Listed in article Apr 1945 as a Lt.
Sille, John, AB (of Belleville, ON) - List in article Apr 1945. 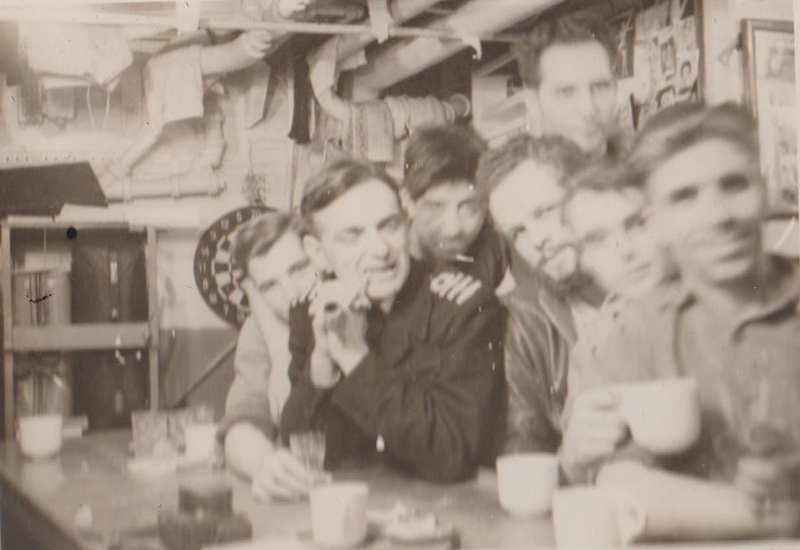 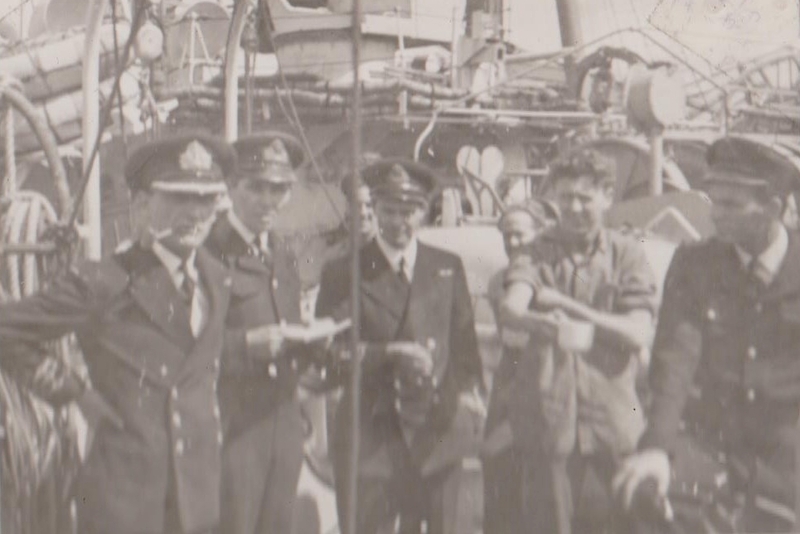 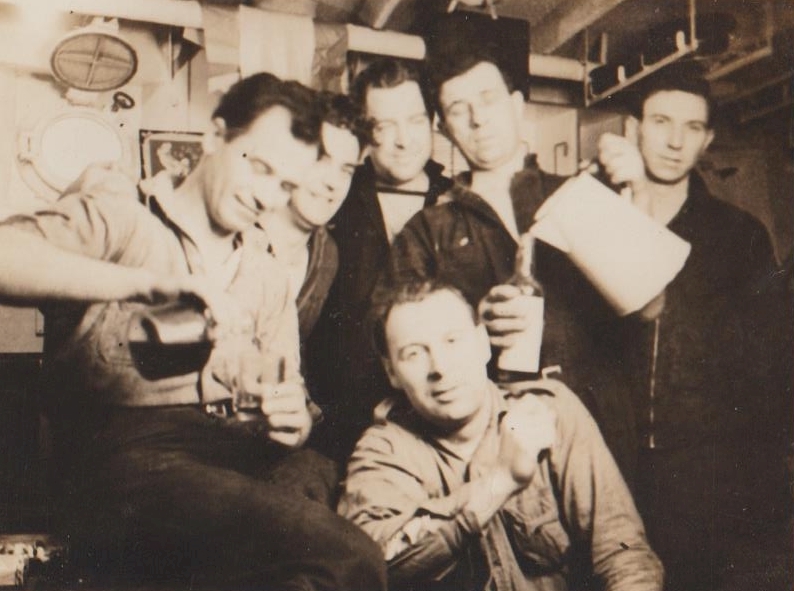 (Front Row, L to R) - Chief Engine Room Artificer L. Jolliffe, London; Leading Stoker R. Walker, Munt Brydges; Sub. 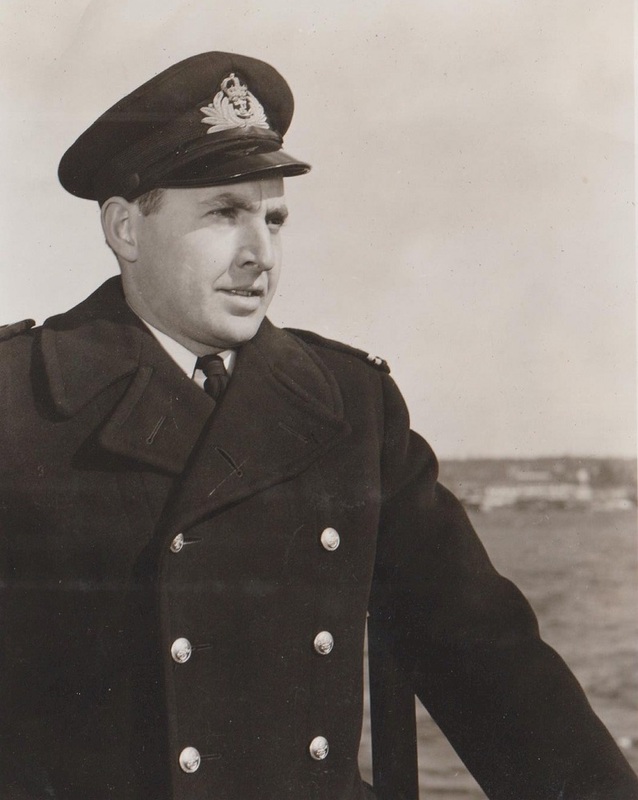 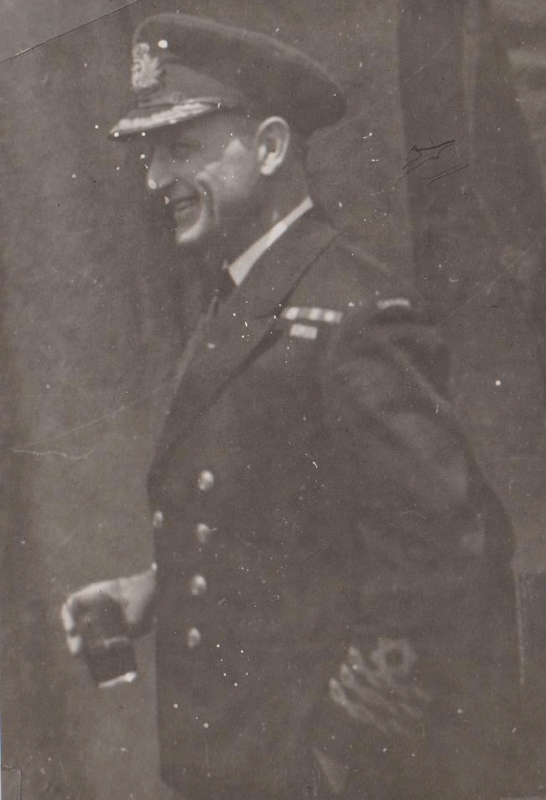 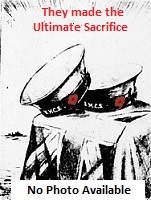 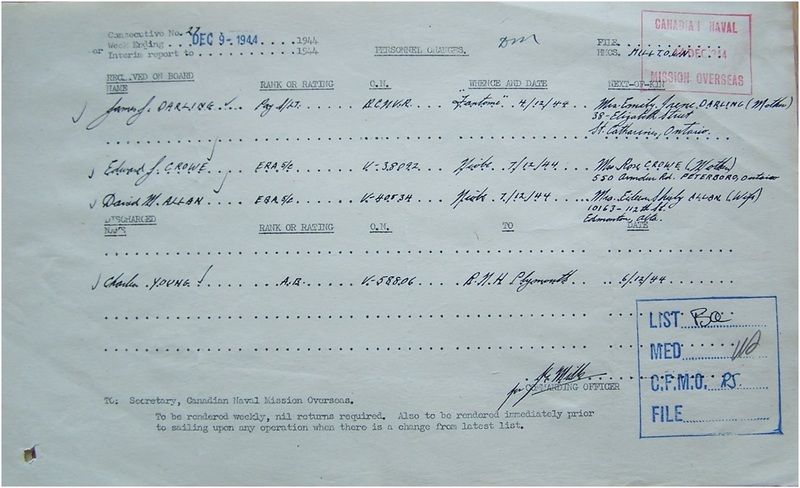 Lt. M. McMillan, Blenheim; Chief Petty Officer R. Mason, Windsor. 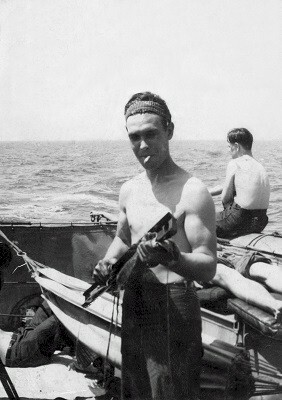 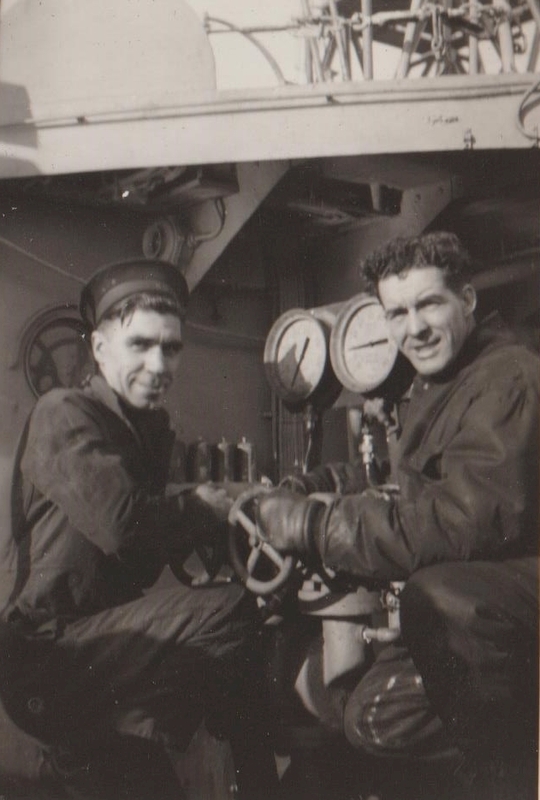 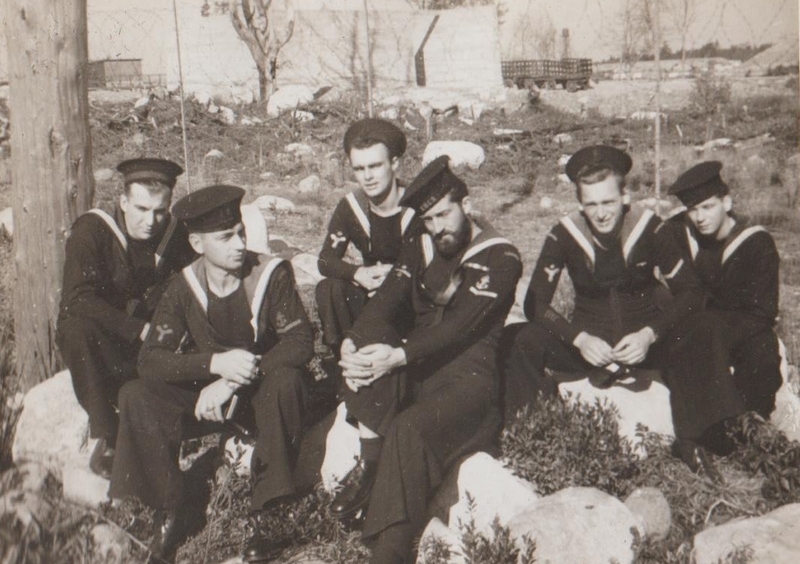 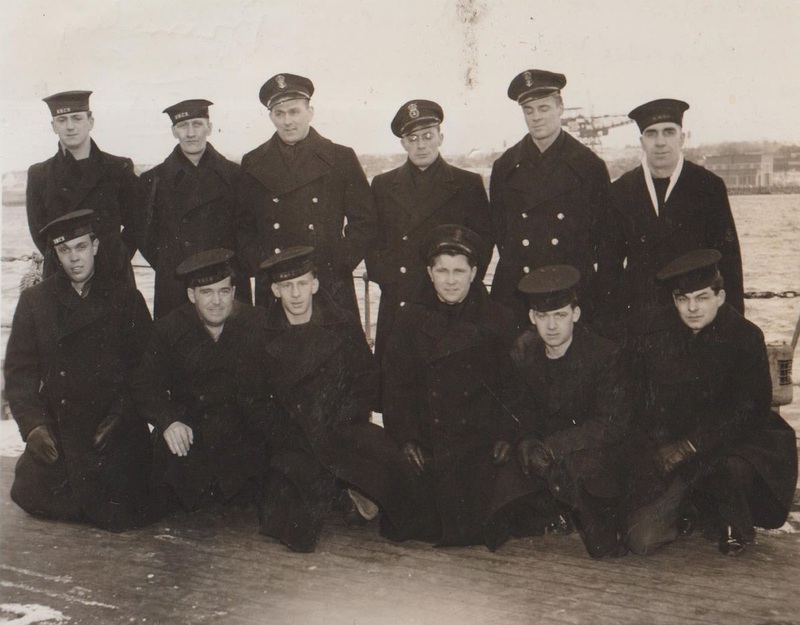 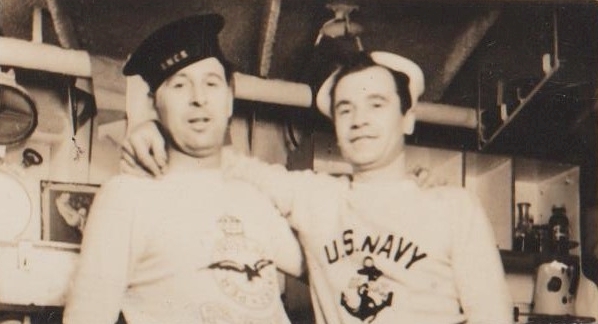 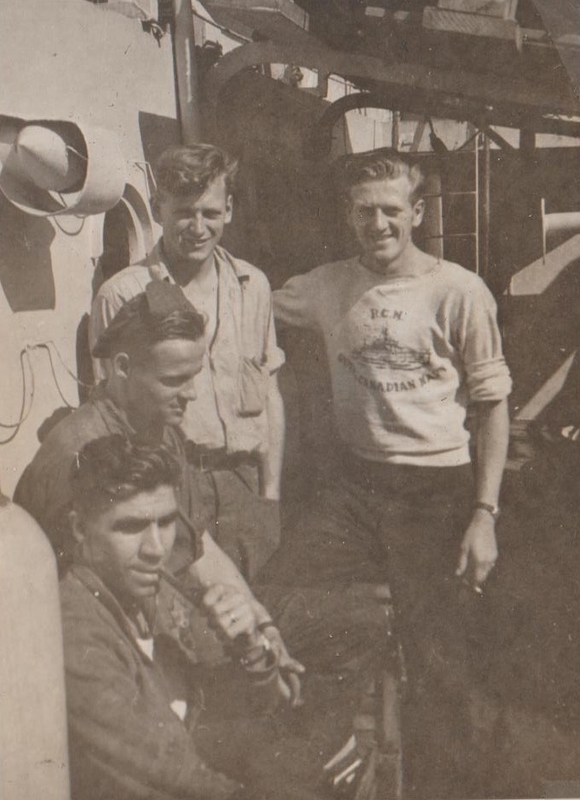 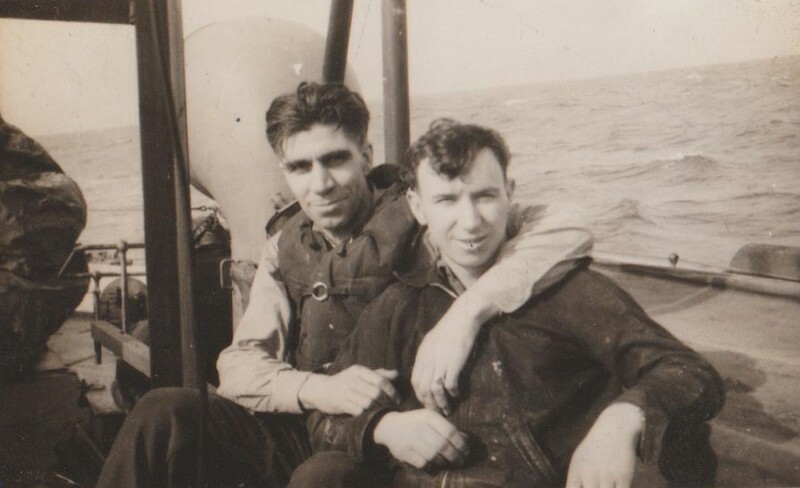 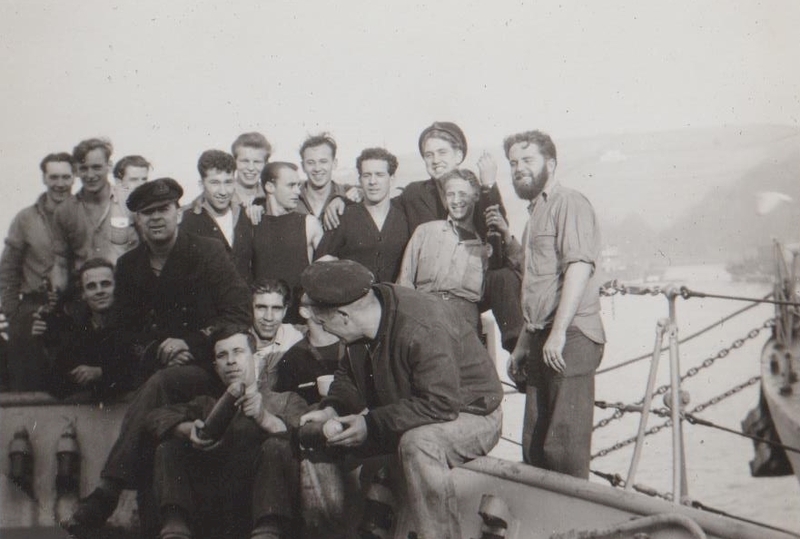 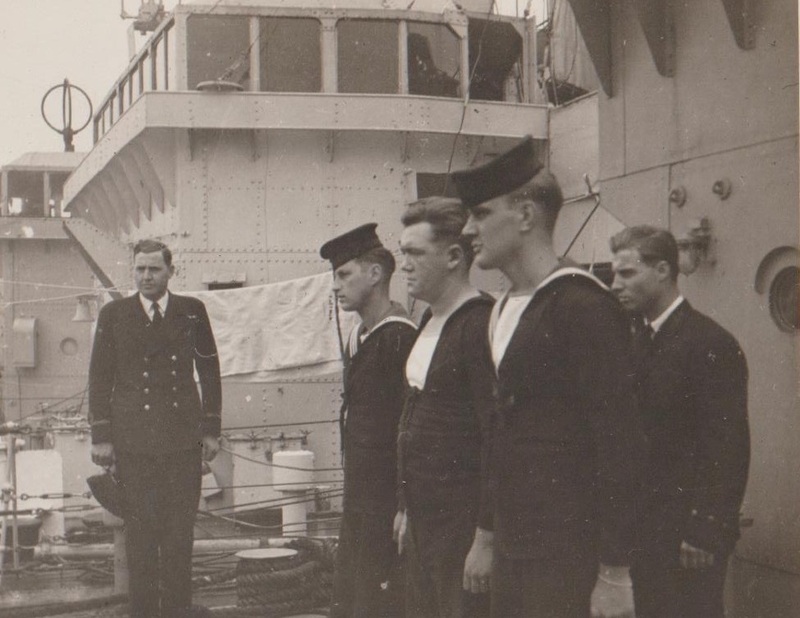 (Back Row, L to R) - Ables Seaman S. Greenham, Harrow (Windsor); Able Seaman L.K. 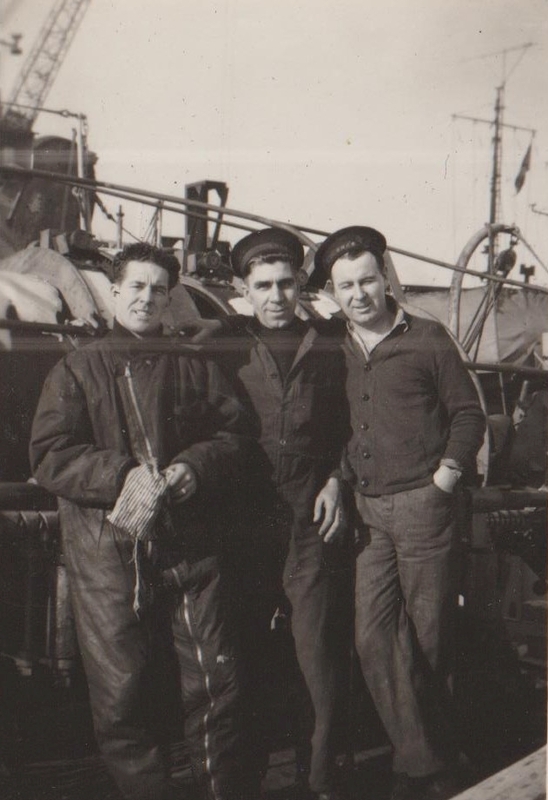 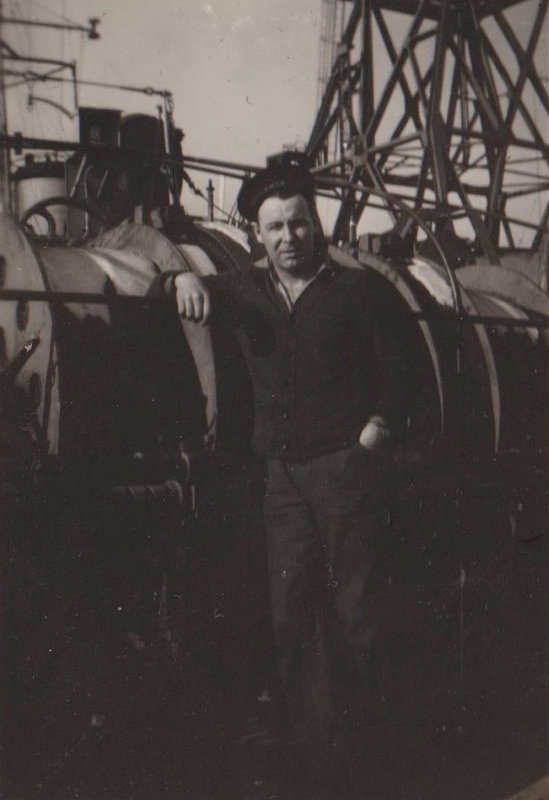 Hopper, Leamington; Able Seaman C. Young, London, and Leading Signalman H. Holman, London. 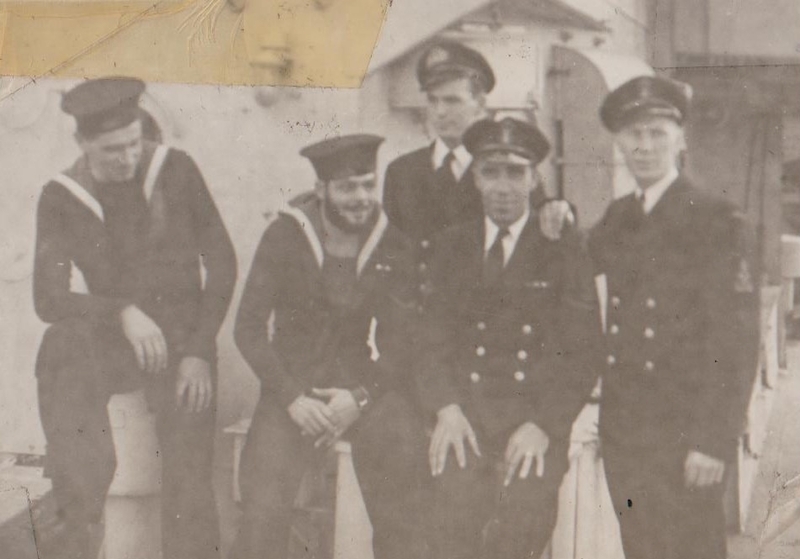 (L to R) - Signalman E. Lawrence, London; Leading Stoker C. Chidley, Stratford; Able Seman G. Warren, Erieau, and Able Seaman J. Evans, Melbourne. 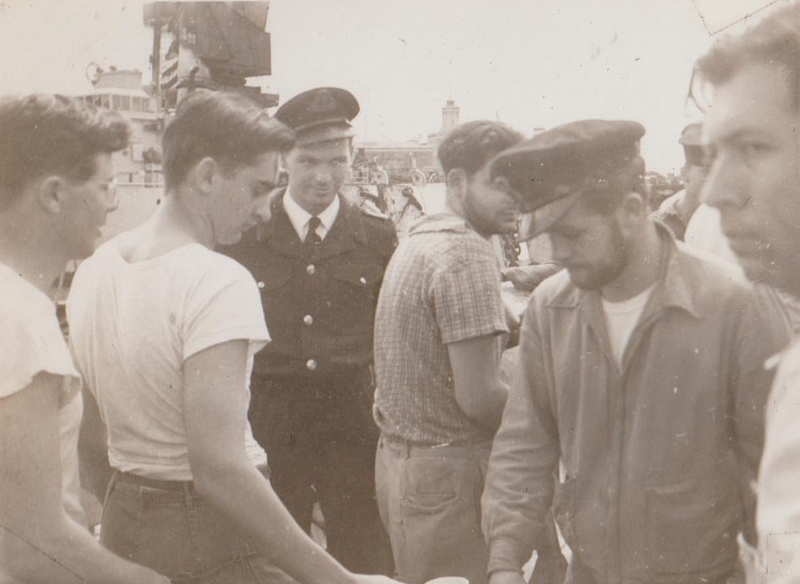 Cdr Storrs, Commanding Officer, HMCS Milltown J317 visiting one of the mess decks. 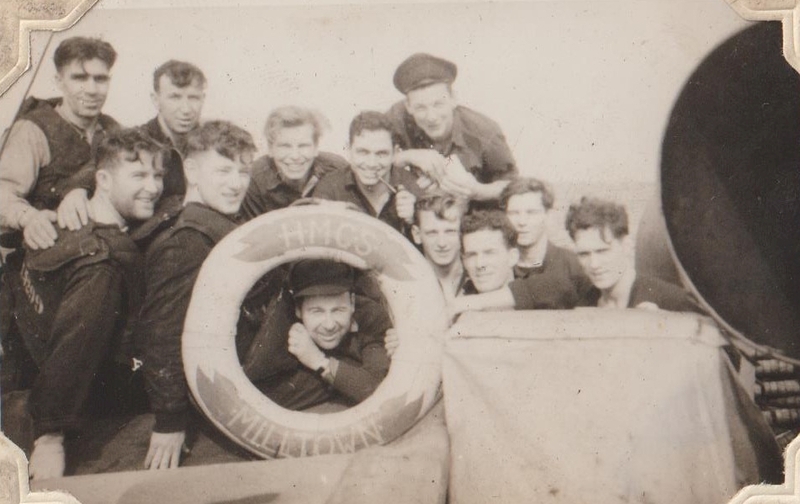 Art Bromley 1st on right. 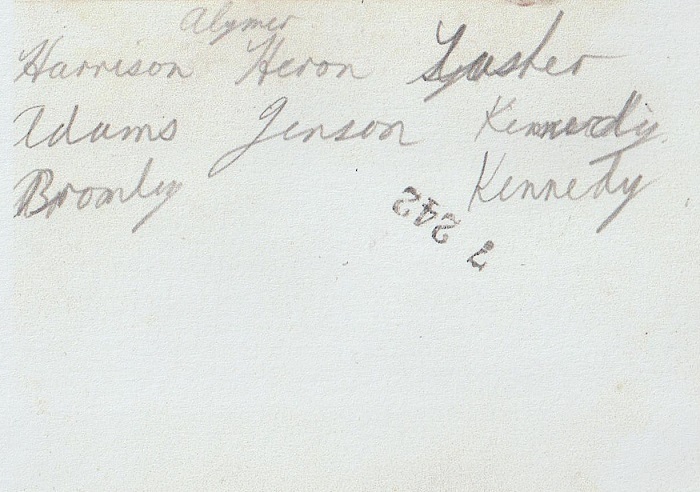 McNiven, James, 1st Lt (XO) of Montreal; Farrell, Frank, Lt of Montreal/Winnipeg; Martin, E.C. 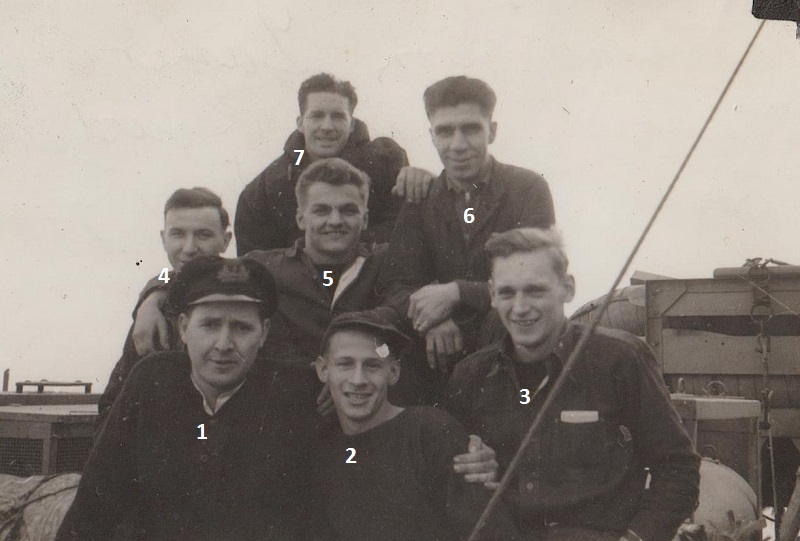 (Bert), Lt; Gain, Howard, Lt of Calgary; Johnston, Len, SLt of Toronto; Pineau, Jo, MID, PO of Port Arthur; Dorrington, Bill, CERA of Peterborough; Holman, Henry (Hank), L/Sig of London, ON; Sille, John, AB of Belleville.